Log homes and cabins evoke a kind of nostalgia to some people, and they can remind us of a simpler time. If you have a soft spot in your heart for these beautiful structures, then you will love to see the plans for The Carolina Log Home. Log homes have been made since the Europeans started to settle in North America. It was the Swedish people that brought the log home building concept to North America and the people back then made use of the materials they could find in their immediate environment and usually practiced a conscious and mindful approach to all the things they did. This charming old-fashioned looking log home, The Carolina, can be made form an easy to assemble kit from eLog Homes, where they offer the best quality in log homes. At the eLog Homes website, you are able to buy the plans for the cabin or home you want to construct so that you have all the proper blueprints to give to contractors and for permits depending on where you live. The plans sell quite affordably at $299 plus $15 for shipping and handling. The Carolina is a very simple yet stately looking home, and is a good size, not too big and not too small. The home itself is 816 square feet on the first floor, and 470 square feet on the second floor, making it a total of 1,286 square feet. The main floor is where two bedrooms and one bathroom would be, according to the plans and then the master bedroom and another bedroom are on the upper level, and they share with en-suite bathroom. There is a really nice sized porch on the front of the home, which would make a great place to hang out and relax and take in the sights and sounds of nature surrounding you. Or also a wonderful place to entertain and host BBQs and dinners. The home is very modest and looks just about the size of any regular house. The design gives it a very familiar feel and makes it great for fitting into any neighbourhood or region. It has quite a country feel to it and calls people to the door to be welcomed into the coziness. The log home has several good-sized windows placed throughout the home, all of which are a fairly good size. Log homes are a wonderful way to build, and eLog Homes uses the highest quality Eastern White Pine in making their log home kits. The Eastern White Pine is known to have fewer knots, which are considered weak spots, and if it does have knots, the ones in the Eastern White Pine logs are actually strong. The White Pine also has a very high insulation rating and is very easy to work with. Their logs are dried for three months minimum to prevent rotting, mould and infestation of critters, and all of the pieces are hand cut. 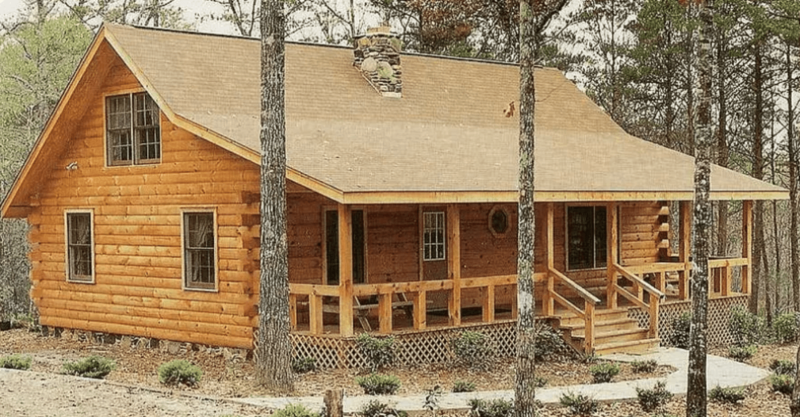 With the rise in popularity of log homes and cabins, there are many places that you can order the prefabricated log homes and cabins from, and eLog Homes makes it as easy and as affordable as possible while maintaining their quality materials and service.